Anna, Doug and Lenny shouted for Britta in every nook and cranny of the townhouse, but she did not answer. The townhouse had been turned upside down. Someone had clearly been looking for something, and Anna suspected she knew what it was. She looked in Britta’s room, but Britta was not there. Anna called fervently, “Britta, where are you?” She ran to her room, everything was overturned, but she quickly noticed the floorplank by her bed had not been disturbed. As Anna stumbled into the courtyard calling Britta’s name, she noticed a red splash of blood on one of the linens hanging from the clothesline that was blocking her view of the tiny courtyard. With mounting fear, Anna pushed the linens aside and fell to her knees screaming. A puddle of blood soaked the ground floor of the courtyard. 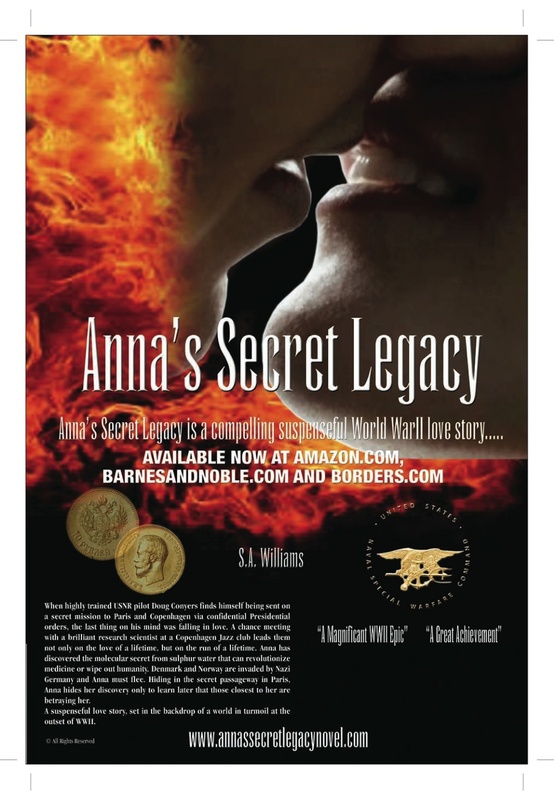 This entry was posted in Amazon, Anna's Secret Legacy, Anna's Secret Legacy Blog, Annas secret legacy novel, Barnes & Noble, Book Blog, Pilots, spies, Travel, World War II. Bookmark the permalink.